Flavored whiskeys are not for everyone and not every bottle produced is worth noting. This is particularly true for fans of straight whiskey. There are a few exceptions, though, and Jack Daniel's Tennessee Honey is one of those shining stars. This is a honey liqueur that is blended with the famous Tennessee whiskey. It does not have that cloying or artificial flavor found so often in flavored whiskey. Instead, it is a perfect marriage of true honey flavor blended with the one and only Jack Daniel's. If you've shied away from similar whiskeys on the market, give this one a try. It will certainly appeal to both whiskey aficionados and those new to the world of whiskey. Since it is blended with honey, Tennessee Honey is technically a whiskey liqueur. It is a spirit created by the whiskey makers at Jack Daniel's, made with real honey and their famous Old No. 7 Tennessee Whiskey. It was first released in 2011 and is bottled at a pleasant 35 percent alcohol by volume (70 proof). This is, by far, the most impressive of the distillery's attempts at flavored whiskeys. It surpasses and is more useful than Tennessee Fire, Winter Jack, and many of their competitor's offerings in this space. There is no toying with the fact that this is just another spin-off of a famous whiskey. It's not a marketing ploy or deceptive in any way. In fact, Tennessee Honey is distinctly Jack Daniel's from the very beginning and straight through to the finish. Jack Daniel's Tennessee Honey features a light, sweet honeyed aroma. This is marked with undertones of that classic, sugar maple and charcoal-mellowed fragrance that we've come to know and love about JD. The liqueur has the same body and mouthfeel as classic Jack Daniel's. Quite simply, it tastes as if you mixed a little local Tennessee honey into a shot of Jack. The finish is clean and sweet, which makes it perfect for any way you want to drink it. When it comes to enjoying Tennessee Honey, the possibilities are endless. It is a valuable asset to any bar as both a straight sipper and a cocktail mixer. Tennessee Honey is billed as both a cold shot and a sipping whiskey. While it's pleasant when chilled, this does dull the honey flavor, which is nice at times but not always desirable. For an ultra-smooth shot, serve it as cold as possible. When you want a flavorful whiskey-backed, sweetened sipper, don't go too cold. Stick with a single ice cube and all will be fine. As with many whiskey liqueurs, simple is often best when it comes to mixing Tennessee Honey. You'll find it a delight when you add a shot to a tall glass of ginger ale or cola for happy hour or on a hot summer afternoon. It's also fantastic with lemonade or iced tea. Better yet, combine the two for a spiked, sweetened take on the Arnold Palmer. It may be obvious, but Tennessee Honey adds an intriguing twist to JD's famous Lynchburg Lemonade as well. Hot drinks are not out of the question either. Bring Tennessee Honey into your winter cocktails by using it as the base liquor or sweetener in a hot toddy or simply use it to spike hot coffee, tea, or apple cider. This is a very versatile liqueur and cocktail inspiration abounds. It can be used as a whiskey substitute in some of the best-known whiskey cocktails. You can also use it to add a little oomph by replacing a sweetener like honey or simple syrup in recipes. For more ideas, turn to other honey-flavored liqueurs like Barenjager and Benedictine. When used as a substitute for either, you will be adding that signature Jack Daniel's flavor, but this can work surprisingly well. Recipes such as the milk and honey and the honey dew me shooter are two good places to begin. 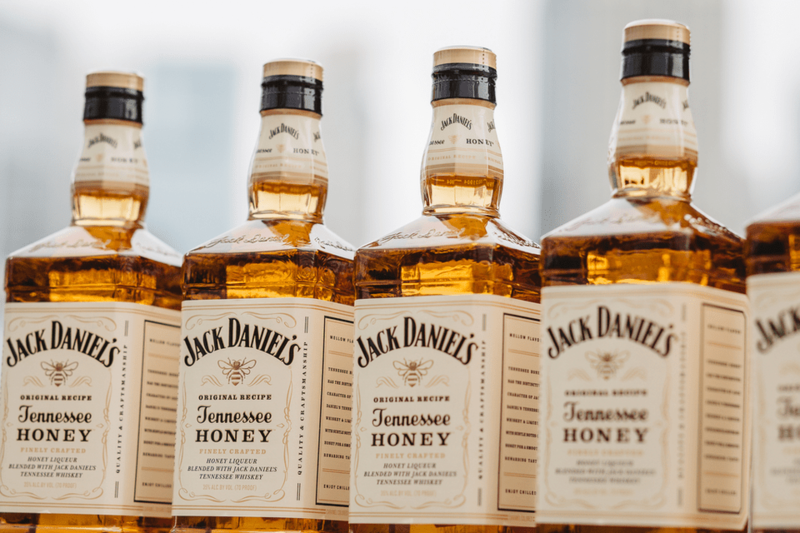 Quite simply, Jack Daniel's Tennessee Honey is a brilliant extension of the Jack Daniel's line and can be enjoyed by whiskey fans of every level. If you enjoy flavored vodkas, don't miss this one, either. The whiskey and honey flavors produce a product that has a deeper, richer, and far more enjoyable flavor profile than any vodka could ever hope to achieve.